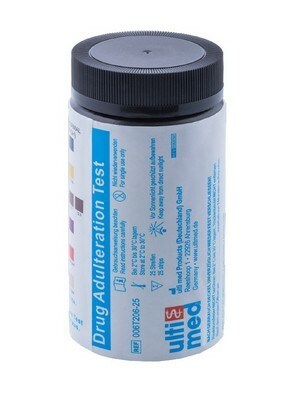 The Drug-Adulteration Test Strips are a semi-quantitative color comparison screen for the detection of Creatinine, Nitrite, Glutaraldehyde, pH, Specific Gravity, Oxidants and Pyridinium Chlorochromate in human urine. This test provides a preliminary screen only. A more specific alternate chemical method must be used in order to obtain a confirmed analytical result. Abnormal results should be sent to a laboratory for confirmation. Each of the plastic strips contains six chemically treated reagents pads. One minute following the activation of the reagent pads by the urine specimen, the colors that appear on the pads can be compared with the printed color chart on the canister. The color comparison provides a semi-quantitative screen for Creatinine, Nitrite, Glutaraldehyde, pH, Specific Gravity, Oxidants and Pyridinium Chlorochromate in human urine, which can help assess the integrity of the urine specimen.